The DS214play 2-bay NAS is turning out to be a popular product for Synology. 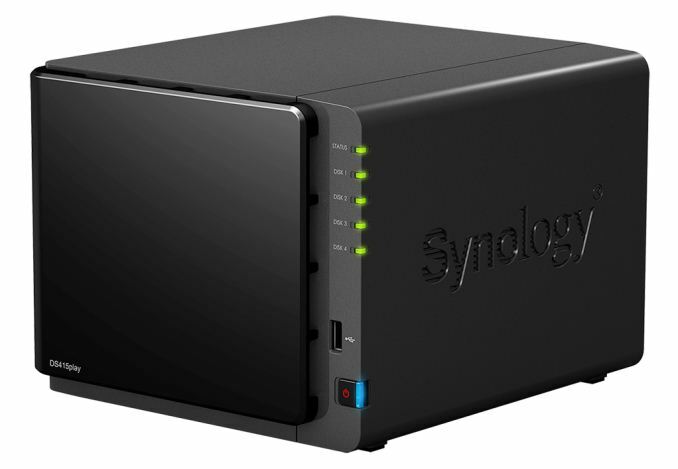 Sensing a lot of market interest in a version with more number of bays, Synology is launching the DS415play today. It is a 4-bay NAS based on the Intel CE5335 Evansport SoC. With this product, Synology joins Asustor (AS-304T) and Thecus (N4560) as vendors supplying 4-bay NAS units based on the Intel CE5335. Synology's approach to Evansport is unique, and we have covered it in detail in our DS214play review. The transcoding capabilities are quite useful and work great for a lot of devices. There are still a few rough edges, but, given Synology's commitment to firmware features, we are sure things will continue to get better. In addition to the Chromecast support that was a great feature while using the DS214play, Synology's PR for the 415play also talks about support for Android TV (not surprising, given that they were already working great with Chromecast). On the hardware side, users not quite satisfied with 2 drives in the DS214play had the option of adding a DX513 to the mix (no option for volumes spanning the two units, though) to get 7 bays in total using the available eSATA port. The DS415play does away with the eSATA port, so there is no possibility of adding in an enclosure to increase the number of drive bays. That said, four bays is probably enough for a large majority of the consumers (considering that 5 TB and higher capacity drives are already in the market). At $540, it is a bit costlier compared to the Asustor AS-304T. However, the transcoding features and app ecosystem probably warrant the increase in price. QNAP's TS-451 is already quite close to launch, and I think that will be the main competition for Synology's DS415play. I've got the ds214play and it's a great NAS – reliable, silent and full of features – but its transcoding ability isn't one of them. It only works with Synologys own apps and not within Plex, which at least for me makes it pretty useless. This will apparently not change either due to the way Evansport works. I have a DS213 for home office use, I really like it and the DSM software. I really want to upgrade to a 4 bay unit with more CPU. That's because I want to run 3 HDDs (RAID 5) + 1 SSD (Cache). I've never understood why but have been told in the past on Synology 4 disk NASs one needs to run 2 HDDs and 2 SSDs with the SSDs mirror the HDDs. That seems perhaps crazy, but at least unfortunate. Otherwise this looks perfect. "given Synology's commitment to firmware features"
I dunno, reading the Synology forums, I don't get the impression that they care very much to fix the issues customers have with their products in a timely fashion, including the DS214Play. Nor is there any word on adding DTS audio support back in that was apparently left off the 214play for licensing reasons. In fact, reading user experiences with their devices is what saved me spending hundreds of dollars by holding off buying a DS altogether until I see some promising updates from Synology. They are pricey and while the OS is more featureful than the competition, each of their devices still seem to lack a bit in various key areas such that there is no one completely satisfactory solution. Either you get the right I/O connectivity but a weak CPU, or you get the Intel CPU but poor connectivity and no DTS support, and so on. If they could release a model with a high quality CPU that can handle encryption and transcoding duties and also pair it with assorted connectivity options and not drop something else off the feature plate, that would be nice. Although, they'd probably then charge an extra hundred dollars for that, pushing it well beyond an appealing price bracket. I do agree with you. For a NAS one would like to get as much functionality as possible. Realizing that price does come into play for all things. But, I too have held off buy a NAS due to seeing that one feature or more is always missing. Just have to see what the remainder of the year brings. I guess if one waits 'forever', one would never buy waiting for the 'perfect' thing. For me, if I cannot use a USB connection to at least copy files to a USB drive for backup purposes, that stops me from buying a 415play.